The International Business program, which is housed within UMSL’s College of Business Administration, earned its 15th consecutive top 25 ranking from U.S. News and World Report, the program received a No. 24 ranking from U.S. News & World Report, marking its 15th consecutive year in the top 25. UMSL hosted the 6th annual International Business Case Competition April 6th- 7th, 2018. This years case was presented by Nidec Motor Eleven teams from schools all over the nation competed in this event, presenting their solutions of "Who will be Edward Jones' client of the future?" to judges from prestigious St. Louis businesses. The two-day event once again highlighted UMSL's dedication to combine classroom knowledge with real-life problems and prepare students for the business world. To learn more about the IB Case Competition, click here. UMSL hosted the 5th annual International Business Case Competition April 8 and 9, 2017. Eleven teams from schools all over the nation competed in this event, presenting their solutions of "Who will be Edward Jones' client of the future?" to judges from prestigious St. Louis businesses. The two-day event once again highlighted UMSL's dedication to combine classroom knowledge with real-life problems and prepare students for the business world. To learn more about the IB Case Competition, click here. The 9th annual International Business Career Conference drew students from across the region and as far as California to UMSL's campus. This year's event under the motto "Going for the Gold" provided students with insights on what is expected from (International) Business professionals. 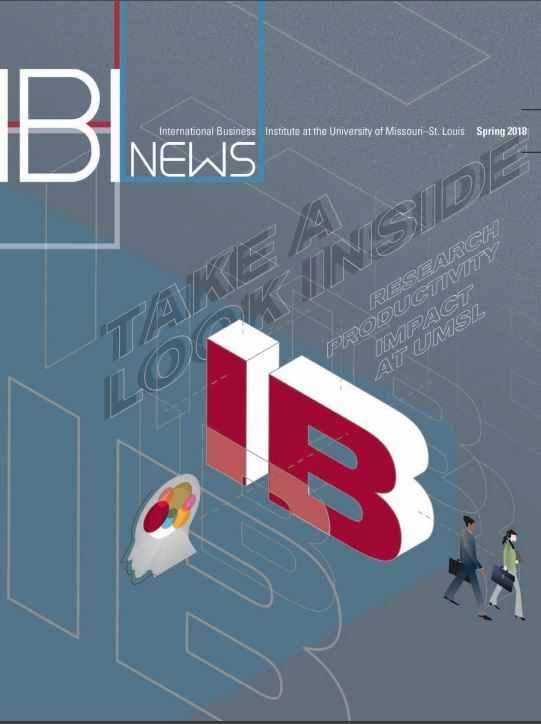 An executive panel, several workshops, and a lunch and learn with St. Louis companies that operate internationally provided students with a well-rounded overview of what could be the next steps with in IB degree. 14 CONSECUTIVE YEARS! The IB Institute and College of Business are proud to announce that the UMSL International Business Undergraduate program has been ranked among the top 20 IB programs by the U.S. News and World Report. This marks 14 consecutive years among the best. The International Business Career Conference, faculty publications, Global Leadership and Management Advisory Board involvement, student groups like the IB Club and IB Honor Society, and the International Business Case Competition all contributed to this legacy of success! During the International Summer School at the Hochschule Bremen, over 300 students from 49 countries studied together. UMSL faculty Prof. Betty Vining and Dr. Joseph Rottman were teaching courses in International Marketing in the European Union and Information Systems Concepts and Applications. 15 students from UMSL took the chance to earn up to 6 Credit Hours during this four-week adventure. They made new friends and memories, and explored Germany and Europe during their long weekends. If you are interested in the Hochschule Bremen International Summer School, stop by our office SSB 456. Scholarships are available! The 4th International Business Case Competition on April 8-9, 2016 drew 12 undergraduate teams from 10 universities to UMSL's campus. This year's case was sponsored by Enterprise Holdings, Inc., dealing with EHI's "Entry into Cuba". Students received the case at noon, April 8 and had 18 hours to research and prepare. Saturday, April 9, they were judged by panels of 3 judges with international experience. Each panel held one judge from EHI. Teams from Truman State University, University of Richmond, University of Missouri - Kansas City, and Babson College then competed in the final round in front of another set of judges, including EHI's VP Global Franchising, Peter Smith. Congratulations to the team of Babson College for winning this year's IB Case Competition and thank you for participating to our judges and all participants. Click here to learn more about the IB Case Competition. The 8th Annual International Business Career Conference set new student records. "Your Connection to a Global Future" drew students from different schools and universities to UMSL's campus. After a keynote address from Scott Bell, VP Global Sales Programs at Siemens, students had the chance to discuss with executives from U.S. Bank, Enterprise Holdings Inc., SunEdison Semiconductor, Boeing, and Monsanto during the Executive Panel. Afterwards, six interesting and informative workshops allowed students to interact with representatives from Masterclock, Nestle Purina, The St. Louis Mosaic Project, Zoltek, The Blessing Basket Project, as well as UMSL alumni now working at Boeing, JCI, and Thomson Reuters. The conference was concluded with a networking luncheon where over 20 companies invited students to get in touch. Continue reading here for more information on the IBCC 2016. We proudly announce that the International Business program landed its 13th consecutive top 20 ranking by U.S. News & World Report. The magazine’s 2016 “America’s Best Colleges” guidebook named the program the 12th best overall. Read the full UMSL Daily article here. 17 undergraduate students took part in the Hochschule Bremen International Summer School. During this program students can earn up to 6 Credit Hours while studying with people from all over the world. Courses are held Monday through Thursday so there is enough time to explore Bremen, Germany and the rest of Europe. If you are interested in this unique study abroad experience get more information on http://studyabroad.umsl.edu/summer/bremen.html or stop by in 456 SSB. The next International Summer School in Bremen will take place in July 2016. 15 curious students took part in this year's China Study Tour with Dr. Fung. The China Study Tour alternates with the Japan Study Tour. Learn more about these exciting ways to gain international experience, learn about new cultures and earn credit by clicking on the links. Students from Finland, Germany and UMSL participated in the Three Way Partnership program in Aschaffenburg, Germany. In two weeks they learned about "Doing Business in Europe: Promoting a Region across Cultures." Besides classes, students visited companies in the region like Linde Handling, the Frankfurt Airport, and the European Central Bank in Frankfurt. Trips to the Faust Brewery in Miltenberg and BMW in Munich combined cultural experience, business, and fun. If you want to learn more about the Three Way Partnership (IMBAi) program, please click here. The next round of the program takes place in May 2016. A strategically important building for the College of Business Administration at the University of Missouri–St. Louis is now a reality because of significant contributions by private donors and taxpayers. Nearly 300 people gathered at UMSL’s Marguerite Ross Barnett Memorial Plaza on Wednesday as Gov. Jay Nixon announced the release of $10 million in state matching funds for the construction of the building. The allocation will be used as a 50/50 match along with $10 million in private and corporate funds raised by UMSL to construct a new 50,000-square-foot building. The project is expected to begin this fall. The building will be constructed northeast of Express Scripts Hall along West Drive and named Anheuser-Busch Hall in honor of a lead $2.5-million gift from Anheuser-Busch Foundation. Anheuser-Busch Hall will streamline all the current business school operations, offering students and faculty a centralized place to collaborate, interact and share ideas within their specific disciplines. It will feature cutting-edge classrooms, modern computer laboratories, faculty offices, seminar and conference rooms, and undergraduate and graduate advising areas. Currently, students and faculty are scattered across five buildings on the UMSL campus. The third annual University of Missouri-St. Louis International Business Case Competition, held on April 17-18, tests students' individual creativity and problem-solving abilities in a collaborative live competition. Teams from many prestigious schools research, analyze, develop and present an action plan for a new, original and actual case a global company is currently facing. This year's event had 12 judges and over 60 participants. Learn more about the annual Case Competition. The annual International Business Career Conference (IBCC) took place on March 6th, 2015. This year's theme, Passport to Success, created an ideal mix of learning and networking opportunities. Participants were able to interact with organization executives, career professionals, and academic leaders who addressed the concerns of today's students preparing to enter the international business workforce. Click here for more information about the annual IBCC. UMSL hosted the 4th IMBAi seminar during this year's spring break. Students from UMSL and our partner universities in Germany and Finland learned about Global Technology and Outsourcing Trends. Besides interesting lectures by UMSL- and guest faculty, there was a wide variety of sightseeing and cultural activities. You want to earn credits during spring break and meet students from other cultures? Check out the IMBA program here! The store at Strange Donuts is barely big enough for a donut case, a coffee counter and a cooler with beverages, but dozens of people line up in the early mornings and late nights for the shop’s creations. The business, and its less traditionally flavored treats, is the brainchild of a pair of alumni from the University of Missouri–St. Louis. Jason Bockman and Corey Smale, opened the business at 2709 Sutton Blvd. in October 2013. “We were optimistic people, and we hoped it would do well. But every time we set an expectation we went well beyond it,” said Bockman, who graduated in 2007 with a bachelor’s degree in international business. Smale, who graduated in 2008 with a bachelor’s degree in communication, and Bockman met at UMSL when they joined the International Business Club. After graduating, they worked in different fields. Bockman continued running the hot dog business that helped finance his education and built a business importing furniture. Smale worked in advertising and marketing. When they decided to launch Strange Donuts, they started building their brand on social media long before they opened their doors. The result was an almost instant hit, proving popular with both early risers looking for an early-morning sugar onslaught and late-nighters looking for post-bar fare. The shop operates in the mornings until they sell out, but on Thursday through Saturday nights they also open from 9 p.m. to midnight. Donuts are $1 for classic varieties like glazed or jelly, and $2 for Creations like thin mint, campfire, key lime pie and gooey butter. Strangers, the rarest and, well, strangest, flavors like the aforementioned chicken and waffles, hog burger and pizza sell for $5. Top-ranked International Business program provides global opportunities for students. Click here for more information! More than 250 students from 24 universities in numerous states descended upon the University of Missouri–St. Louis to take part in the sixth annual International Business Career Conference. Students got down to business this summer in Bremen, Germany, as part of the UMSL Study Abroad program. The International Business Institute, over a three-day span, hosted this year's Midwest Model EU. In attendance were over 80 students from 8 universities. The International Business Institute was proud to host the First Annual UMSL International Business Case Competition. This year's IB Career Conference broke attendance records as students and business leaders gathered at the J.C. Penney Center. The IB Program ranked among the top 20 best undergraduate international business programs for the eleventh consecutive year! The National Student Exchange provides students opportunities to study out of state but still pay in state tuition and fees. For more information, click here to view the flyer. IB Alumnus, BSBA international business 2007, takes on a new role and challenge as the business development manager of the Prague branch of Consolidated Graphics. Taiwan’s National Kaohsiung First University of Science and Technology (NKFUST) joins the growing list of partner universities in China, France, Japan, India, and Mexico. UMSL welcomes its newest partner.